Including a video about you or others on your team entices viewers to stay on your site longer. It also helps them to retain more information about your practice. According to IMPACT, viewers retain 95% of a message when they view it in a video versus 10% when reading it in text. With those kinds of figures, why wouldn’t you include video in your site? So, we’re not saying you can’t include that bio alongside your “Meet the Dentist” video, just know your patients, both existing and potential, will remember more about you from your video than from that written bio. Don’t forget how much of a differentiating factor it is to include a “Meet the Dentist” video on your site. If you remember from our article highlighting Harrisonburg Family & Cosmetic Dentistry, including this kind of video into your site immediately gives you an advantage over your competitors who aren’t using video. It’s one of the best ways to establish a personal connection with your patients. 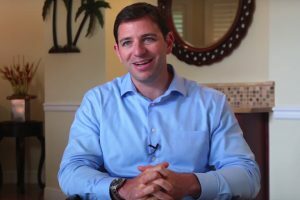 In this video, Dr. Gilbert provides visitors a glimpse into his life: why he got involved in dentistry, his specialties and what he enjoys in his downtime. Think of how you can highlight your story in your own “Meet the Dentist” video! The video’s various shots demonstrating Dr. Gilbert’s interaction with his patients makes it easy to believe him when he says, “I approach every single patient the same: how would I want to be treated if I was in the same circumstance? I always ask patients the same question, ‘What can I do for you?’” His easygoing nature puts the viewer at ease. When you visit Dr. Gilbert’s bio page on Pelican Landing Dental’s site, you see a professional headshot of Dr. Gilbert, a clearly-stated bio, and a link to the video from his photo. The close-up shots and personal testimonials help the viewer to connect with Dr. Gilbert more readily; he appears approachable and down-to-earth. When he lightheartedly chuckled about the number of hours of continuing education he has to have in order to maintain his MAGD, it seems more like a conversation between friends than an on-camera interview. Including Dr. Gilbert’s story of how he became interested in dentistry (“I thought that was a very cool job because you got to do something very technical to a high degree of specificity with a great focus on quality”) goes hand-in-hand with his mention of obtaining his Mastership from the Academy of General Dentistry. Specialization is important to him, and by getting his MAGD, it demonstrates that to not only the viewers, but his patients. He talks about how important his family is to him, and how he enjoys fishing and skiing. By including family and travel pictures, you get to see the man behind the coat and learn more about his passions outside his practice. Dr. Gilbert’s personality shines through, which is a big selling point for patients. Dr. Gilbert appreciated the ease in which he could work with TNT Dental to tell his story. 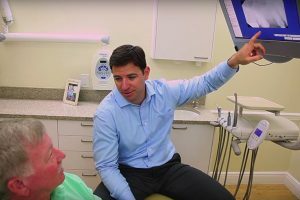 TNT Dental’s Co-founder, Tim Kelley, enjoyed collaborating with Dr. Gilbert and his team at Pelican Landing Dental and the production staff at TNT Dental on this video. Just remember, if you’re ready to partner with us to create your “Meet the Dentist” video, you don’t have to treat it like a reporter’s live shot. We can take your footage and edit it to make the best quality video, showcasing your best you. Are you ready to let patients in on what makes you and your team special? At TNT Dental, we’re ready to help you tell your story.